Great cookbook!!!!! I love anything with lemon flavor. Thank you Susan! 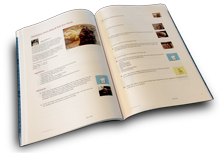 That recipe does look great and will go nicely in my second edition I'm working on! Thanks you for letting me know about it! Thank you Janet! I love lemons too and found so many great recipes with them I wanted a cookbook with them all. Then I found there are a whole lot more recipes using lemons that I could not get in this book so I have a second book I'm working on. Love your lemon bars Janet1 Can't wait to make them! GREAT book Tammy! Love love lemon and Thank you for adding my lemon bars! HUGS!!! Thank you Nancy! I always love your recipes! Thank you for posting such good ones! And thanks for your kind words! Luv! Thank you Tammy for including my lemon chicken, and church style lemon roasted potatoes in your very lovely book of lemon recipes with lots of good info. and tips. "Hugs"! 8) Great Job! I am honored to have it Susan! Thank you for posting it, it looks delicious! Can't wait to try it! Thank you for the compliment on the book! Tammy thank you for including my families recipe for Bonnies lemon Cake.. Wonderful job on your cookbook. Hi Fran! My Grandmother use to make homemade lemonade when I was young and it was the best! I have very fond memories of that and the way you make yours is how she made hers. I remember squishing the lemons gently against the big mayo jar she used thinking I was such a big help. So I really appreciate your recipe! Dorothy, as you can tell I really love your hint as I used it in a previous book as well. I also tell people about that tip, thank you again! Thank you Susan! Love your Mother's Pie Recipe! Thats going to be great for the summer! Yumm! Thank you Nancy! I am so glad you like this book! I use the lemon soap too, I just love the smell! And I love your Potato wedge Joe Joes, I've not seen them made that way so can't wait to try them! Thank you! Luv! Thank you Ellen for the kind words! I love lemons too and I want to try that lemon drop martini too, I hear their very good! I'm working on the second lemon book now as there are so many good recipes and ideas. Luv!